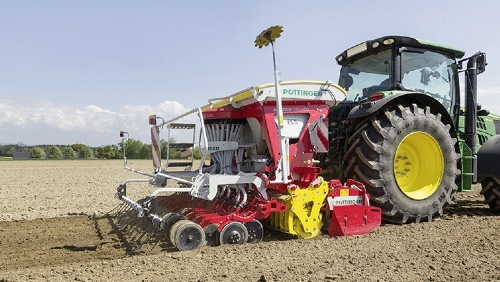 The PÖTTINGER TERRASEM mulch drilling concept combines soil cultivation, re-consolidation and planting in a single machine. 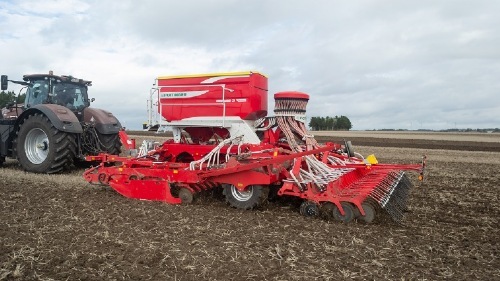 The effective compact disc harrow, unique tyre packer and perfect coulter design deliver optimum results. No. of centre press wheels 6 pcs. 8 pcs. 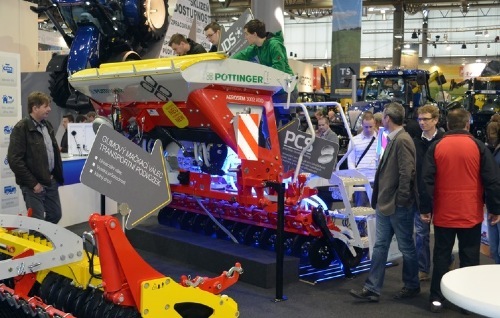 The PÖTTINGER TERRASEM mulch drill concept has been engineered in detail from the drawbar to the rear harrow tines. 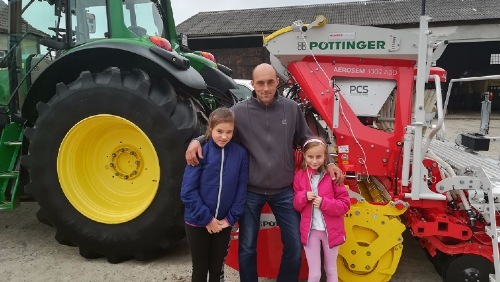 A top quality compact disc harrow, an effective packer tyre chassis and optimised coulters, PÖTTINGER perfectly integrate seedbed preparation, consolidation and drilling across working widths of 3 to 9 metres. 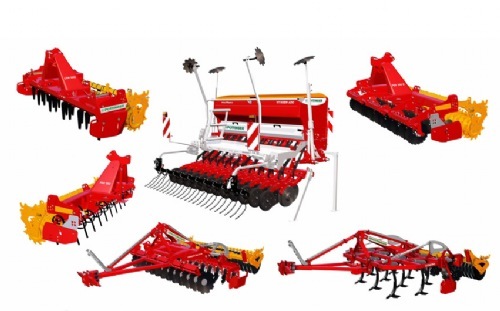 The TERRASEM universal seed drill can be economically incorporated into any operating sequence, regardless of whether it is deployed for mulch or conventional drilling. These machines deliver precision seed placement thanks to their parallel-guided DUAL DISC coulters with rear depth control press wheels. This configuration ensures unique ground tracking capability and uniform seed placement depth. 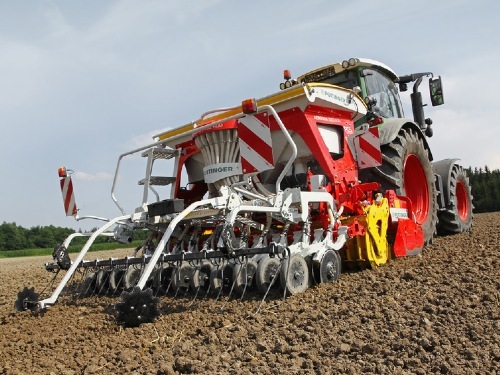 Central coulter pressure adjustment between 40 and 120 kg per coulter, high-capacity seed hoppers and intelligent control systems also contribute to the success of the drilling process. Using direct fertilisation on the TERRASEM FERTILIZER models enables micro and macro nutrients to be deposited at the same time as the seed. Optimum growth conditions are available during the early phases of germination to increase the plant development performance of the seed as a result. Fertiliser is applied on TERRASEM FERTILIZER mulch seed drills using DUAL DISC precision coulters. Our new low draft WAVE DISC with a diameter of 510 mm is designed especially for low disturbance. With the WAVE DISC the soil is not moved to the side, but is loosened in strips. This prevents smearing at seed slot level. Row spacing of 12.5 or 16.7 cm is possible. The maintenance-free, rubber-mounted discs loosen and mix the soil. An ideally structured layer of fine soil is created at seed level. The chassis with its wide 425/55 R17 tyres consolidates the area of 4 seed rows at a time ahead of the drilling coulters. The flexing characteristics of the tyres promote self-cleaning and improve the fine structure of the tilth. The machine is supported by all wheels at headlands when raised out of work. The chassis frame always remains in the same position; only the disc harrow and coulter rails are lifted. 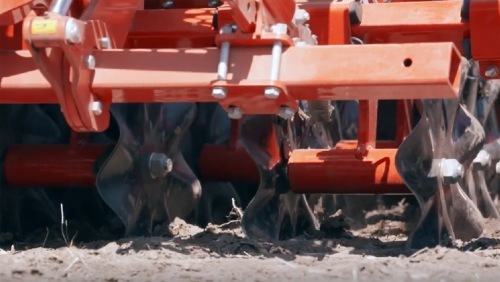 The maintenance-free DUAL DISC coulters are mounted in an offset configuration; each pair of coulter discs is mounted on a separate parallelogram to form the seed slot. All coulters are guided by individual press wheels to ensure uniform seed placement depth. Heavy duty 2-component synthetic casing with rubber edge guard. All units feature an illuminated graphic display. Raised back-lit keys offer optimum visibility at night. 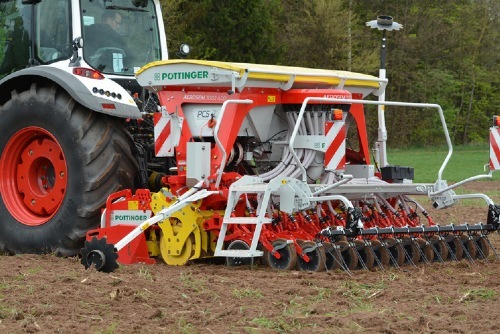 A total of 22 keys offer the highest level of convenience for operating PÖTTINGER TERRASEM seed drills. For tractors with at least three remote valves: Functions are operated directly using the tractor remotes. A single-acting connection with return or load sensing for driving the fan. Three double-acting remotes are required for the rest of the functions. Direct control of functions via tractor remotes. One double acting remote is required for all other functions. The PÖTTINGER EXPERT 100 ISOBUS terminal not only offers all the functions provided by the ARTIS PLUS terminal, but also enables professional operation of all ISOBUS-compatible machines from a wide range of manufacturers. High quality 8.4" TFT colour touch-screen. Soft keys on left and right. Ambient light sensor and back-lit function keys. Edit using keys and touch-screen. Scroll wheel for direct input and adjustment of setpoints. 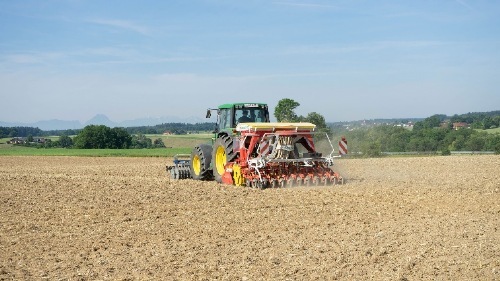 The seed rate can be adapted automatically using application maps prepared in advance on your office PC to enable site-specific drilling depending on soil conditions. To ensure traceability at a later date, the data can be archived for comparison over the long term on the office PC. Variable seed rate is another way to optimize earnings. GPS controlled stop/start at headlands. Differences in the soil and yield potential within a field can be taken into account during drilling. Site-specific seed rates optimise the results. Precision application of seed, fertiliser and spray utilising technology saves up to 5% on variable costs or up to € 50 / ha. These models do not fold for transport utilising a rigid frame construction. The transport width is the same as the working width (3.0 m or 4.0 m). During road transport the wing sections of TERRASEM C models are folded up for a transport width of 3.0 m. The three-section design of the TERRASEM C drills provides perfect ground tracking. The outer elements have plenty of freedom of movement. The lower linkage drawbar offers Cat. 2 and 3 mountings. The pivot point on the drawbar enables a turning angle of up to 90°. Also available as an option is a telescopic drawbar which can be lengthened by up to 50 cm. This allows tight cornering at headlands and during transport, even with dual wheels or wide tyres. The telescopic drawbar is also available with a tractor drawbar or hammerstrap coupling. These machines can therefore be fitted to any tractor. All hoses and cables are routed tidily in a protective housing to the tractor. When parked, they can be stowed neatly in the holders provided. On the road the machine is transported on four wheels, the two centre wheels are raised automatically when folding on C models or manually on R models. High travelling speeds are possible as a result of the excellent stability offered. Air brakes or hydraulic brakes are available as an option for the weight-bearing pairs of road wheels. These ensure safe braking from the highest permissible speed of 40 kph. The chassis with its wide 425/55 R17 tyres consolidates the area of 4 seed rows at a time ahead of the drilling coulters. The flexing characteristics of the tyres promote self-cleaning and improve the fine structure of the tilth. The offset wheel configuration makes the drill easier to pull and improves the ride during operation. Each wheel can rotate independently without smearing when turning thanks to the individual wheel mounting system. Scrapers for the packer wheels are available as an option. The weight-bearing wheels used during road transport can be optionally fitted with brakes. Even at high driving speeds, the brakes (hydraulic or pneumatic) ensure reliable braking. What farmers want: A level surface with fine tilth at seed level for uniform growth. 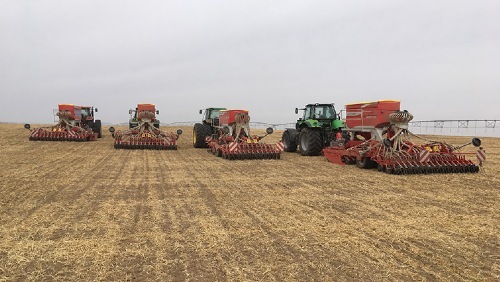 On TERRASEM mulch seed drills, soil preparation is taken care of by a two-gang disc harrow with smooth or scalloped discs. The disc harrow also works well on heavy soil even with large quantities of harvest trash. The maintenance-free, rubber-mounted 510 mm diameter discs loosen the soil on the surface across the entire working width. At seed level they leave behind an ideally structured layer of fine soil. The disc harrow delivers perfect results even on heavy soil and in large quantities of harvest residues. Infinitely-variable hydraulic depth adjustment – the first gang of discs can be adjusted independently of the second. Spring-mounted edging plates are fitted as standard on both sides for a uniform surface finish. 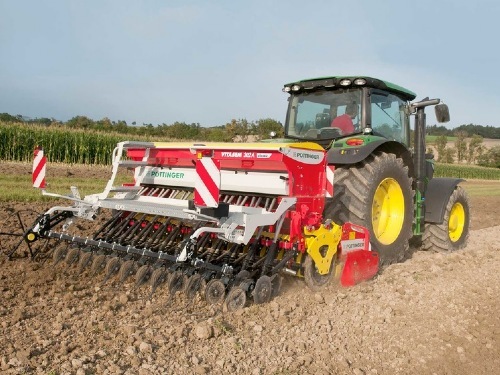 The disc harrow can also be specified with the optional front mounted levelling board in addition to the levelling board installed just ahead of the packer wheels. The special twin-race angular contact bearings have been adopted from the construction machinery industry. Ruggedness and reliability are guaranteed as a result and impacts are absorbed perfectly. The sealed, twin-race tapered bearings are completely maintenance-free. A labyrinth seal provides perfect protection for the bearing. A metal cover encapsulates the labyrinth seal for additional security. Proven over many years in the field, the maintenance-free NON STOP trip protection system features 40 mm thick rubber elements. The clamping brackets are mounted on a thick-walled box section frame. Four rubber elements between each wide clamping bracket and the box section provide the discs with high penetration power. Two pairs of discs behind the tractor wheels are available with independent depth adjustment. Even heavily compacted wheel marks can be removed to create a uniformly level surface. Cost-effective, extremely versatile and convenient, this is the new WAVE DISC leading disc system for seed slot preparation. In dry regions or in wet areas – all the WAVE DISC's advantages come into play to make it the perfect example for reduced soil cultivation while increasing yield. Completely in-line with low disturbance, smart soil cultivation. 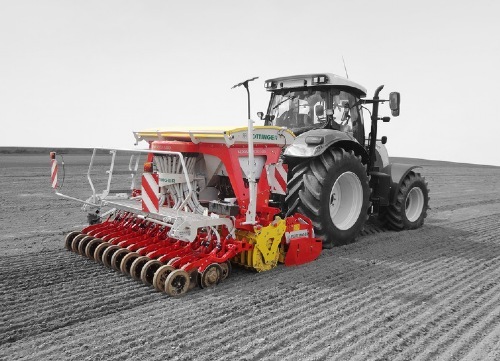 The WAVE DISC cultivates the soil in water-saving strips: only the region either side of the seed slot approx. 50 mm wide is worked. The rest of the surface remains untouched. Additionally the WAVE DISC can be a tool for regulating resistance to herbicides. The maintenance-free WAVE DISCs have a diameter of 510 mm and are available with row spacings of 12.5 cm or 16.7 cm. 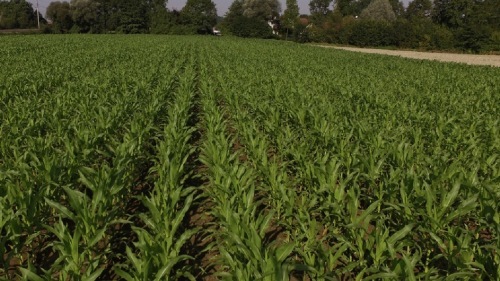 A row spacing of 16.7 cm is recommended for regions with extremely heavy, wet and sticky soil conditions. 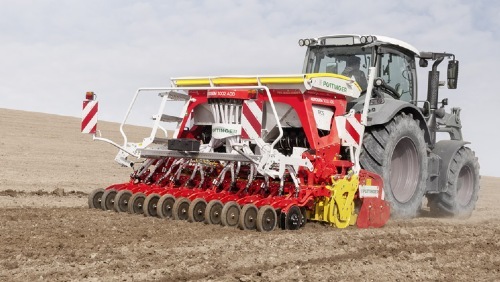 The working depth is infinitely-variable controlled by a hydraulic system like on a disc harrow. The WAVE DISC low disturbance effect is particularly effective in minimising germination of weed seeds. The minimised soil movement creates poor germination conditions, especially for light-dependent germinating weeds. 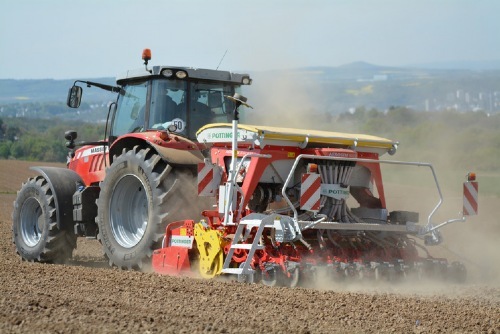 WAVE DISC enables water-saving strip tillage of the soil: A strip only around 50 mm wide in the vicinity of the seed slot is cultivated; the rest of the surface remains intact. That is how the soil is moved as little as possible in order to reduce evaporation. The water is retained by the uncultivated soil. In wet areas the damp soil can only be moved very slightly in order to prevent smearing at seed slot level. Sowing early while the soil is still very wet. Unworked soil between the rows suppresses weeds. The minimised soil movement creates poor germination conditions, especially for light-dependent germinating weeds (e.g. black grass). At sites with high levels of weed growth, reduced soil movement gives the crop an advantage. Less herbicide is needed as a result. Tractor power saving thanks to reduced tillage intensity. No full surface soil movement - instead only a narrow strip of around 50 mm is cultivated. Up to a week earlier in the field ensures an extended service life of the machine. Minimised cultivation leaves behind a lower proportion of loosened soil and a smaller cultivated area. Less risk of ponding during heavy rain. Reduced blowing of light and fine soils in strong winds. Each track eradicator is protected against stones/foreign objects by a spring. The working depth is easily adjusted. The reversible point is coated with hardened metal in the wear zone. Up to three track eradicators per track are clamped and can be adjusted individually to the track width. Lifts at headlands by folding the tines upwards. 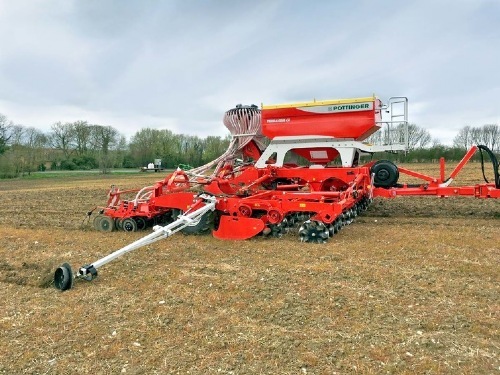 On areas with a well-prepared seedbed the intensity of the disc harrow can be reduced, which in turn reduces the power requirement. Adjusted automatically with the leading tillage tools. The hopper can easily be filled using a loader, big-bags or an optional hydraulic seed hopper auger. A roll over tarpaulin serves as a dust-proof and rainproof cover. This is rolled completely out of harms way when filling. The standard loading platform makes it easy to open the hopper cover to check filling progress. The mesh inside the seed hopper protects the metering system from foreign objects. The hopper level monitoring system is installed as standard equipment. A seed hopper extension is available as an option. The toolbox is well protected, integrated under the loading platform. The optional side platform automatically folds into the transport position when the side sections of the drill are folded upwards. The side platform is fitted as option. The auger receiving hopper is mounted on the front right-hand side and can easily be filled after lowering the auger. The auger is powered by its own hydraulic system without requiring additional connections to the tractor. The two-section auger folds up hydraulically after loading and a closure flap automatically shuts-off the auger pipe. High throughput capacity of up to 500 litres per minute. The powerful fan is driven hydraulically and outputs a high volume of air in the mid-speed range, so it runs quietly without producing a "singing" noise during operation. The high air volume means the fan speed can fluctuate without affecting the accuracy of seed metering. The fan dust filter is optional on TERRASEM R to C6 seed drills, and is fitted as standard equipment on the C8 / C9 and all FERTILIZER drills. The TERRASEM metering system is designed for the highest possible precision and ensures that exactly the right amount of any given seed type is used, even in the most difficult operating conditions. The TERRASEM R3 to C6 have one metering system, while the C8 and C9 have two. Metering wheels can be changed quickly and easily, dependent upon seed rate and type. A reduction gear ensures that the metering wheel is always operating in the ideal speed range. The metering unit is electrically driven, controlled via a radar sensor or ISOBUS signal from the tractor. Seed output can be set directly from the cab between 0.6 kg and 350 kg/ha. Automatic metering wheel control with pre-metering provided as standard ensures continuous drilling and avoids unsown areas. Calibration is a straight forward affair using the practical calibration bag provided. To ensure correction operation the calibration flap position is monitored by a sensor. Simple and fast emptying of any remaining seed in the hopper is facilitated through the hopper emptying shutter. The electric metering unit provides a variety of advantages at all TERRASEM models. Changeable metering wheels with quick-release connector for all seed types. A high volume of air and low air velocity protect the seed and any dressing against damage. Together with the precision metering system and large distributor heads, this system delivers uniform seed grain placement. Maximum effectiveness of seed and dressing is ensured. Standard row spacing is 12.5 cm. Special distributor inserts can be used to alter the row spacing. 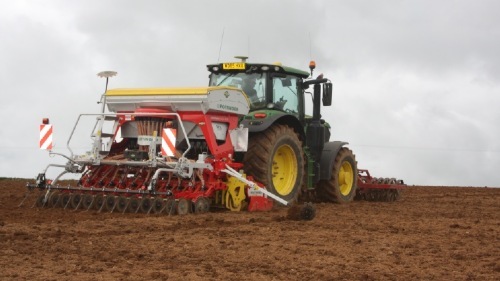 R3 / R4 / C4 / C6 seed drills have one distributor, while the TERRASEM C8 and C9 models are equipped with two. On the TERRASEM C8 / C9 both distributors are automatically retracted hydraulically during the folding process. The seed is fed uniformly to the distributor in an air stream that passes up the riser tube. The large diameter of the distributor guarantees exact distribution of the seed into each of the seed pipes. 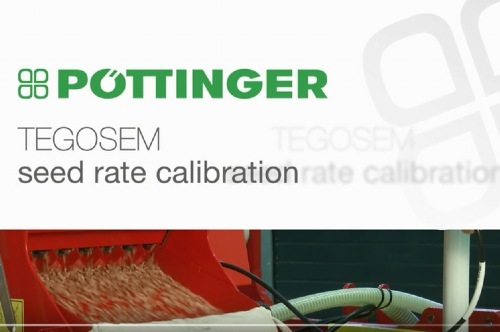 All new PÖTTINGER pneumatic seed drills are subjected to a distribution analysis test before they leave the factory. The records of the tests and measured values are archived in the machine database. Tramline switching is performed electronically using actuator motors. The tramline system is symmetrical or asymmetrical, with customised and half-rail switching also available. Flaps in the distributor close 3 – 5 seed lines per track. The excess seed is returned to the riser tube therefore automatically the overall quantity of seed output is reduced, saving up to 6% of seed material. Exact and even distribution across the whole width, even when tramlining. As an option, optical seed flow sensors can be provided for each individual row. In the event of a blockage the control terminal indicates which row or rows are affected. Successful sowing is dependent on closely-matched coulters for opening the seed slot, placing the seed and covering the seed again. A well-formed seed slot is essential for successful drilling. The guarantee for optimum placement and uniform germination. The large DUAL DISC coulters cut right through surface trash to form a uniform and tidy seed slot. In combination with the delivery pipe between the discs, the seeds are placed at defined intervals, covered with a layer of fine soil and pressed down by press wheels. The seed is delivered in front of the coulter hub and each seed is placed with precision in the seed slot. Each disc coulter is mounted on an independent parallelogram to ensure excellent ground tracking. All disc coulters are guided by a press wheel to ensure uniform seed placement depth. Both the front and rear coulter arms are the same length. They are mounted on staggered coulter rails to ensure the same pressure on each coulter. An easily adjusted turnbuckle ratchet on the coulter rail is used to adjust seed placement depth on each section. The coulter pressure is applied hydraulically between 40 and 120 kg. The maintenance-free rubber mounting elements provide optimum freedom of movement for each unit. With an inter coulter rail spacing of 320 mm, the offset configuration allows a row spacing of 12.5 cm for optimum plant distribution density. 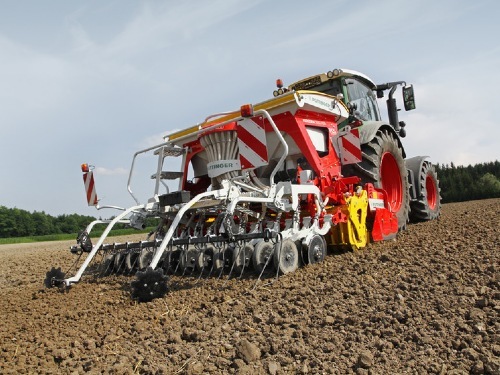 The three section design of the TERRASEM C drills offers the perfect ground tracking across the whole working width. These folding sections are hydraulically preloaded using nitrogen accumulators to provide equal pressure distribution in any working position over the whole working width. 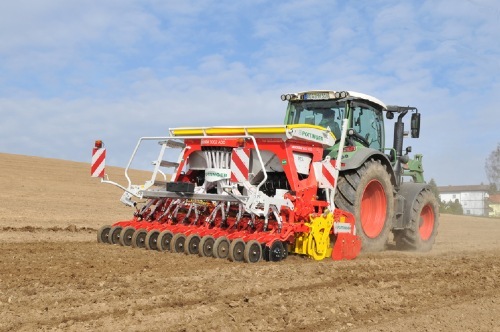 The folding disc harrow frames, packer and coulter rails allow a freedom of movement of up to 5 degrees up and down to adapt to ground contours. This ensures that the whole soil surface is completely worked. The placement depth can be adjusted centrally on each three-point unit. Centre and wing sections are mounted via a three point linkage system to the packer frame. By attaching each section via a 3-point linkage on to the packer frame, each coulter section is free to follow the ground contours. The coulter sections can adapt to uneven ground in the direction of travel. 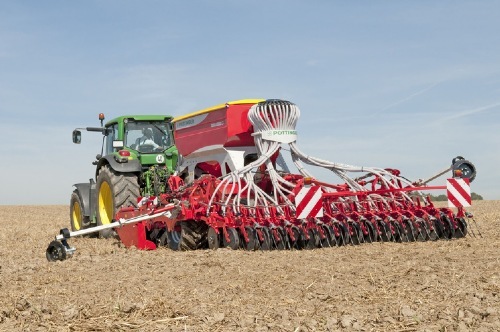 Precise ground tracking with a consistent coulter pressure is achieved thanks to the parallel coulter linkage. The coulter arms are all the same length; it is the coulter rails that are offset. This ensures that precisely the same pressure is applied to each coulter for a consistent seed depth across the entire working width.